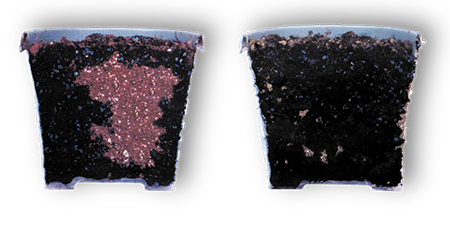 Most soilless mixes are made up of various combinations of peat, bark, and a variety of inorganic amendments. These components are naturally hydrophobic. When they dry out, they prevent water from penetrating and spreading evenly. The result is an inconsistent rootzone with over-saturation in some areas while others remain dry. It also leads to water waste from run-off and unhealthy plants. To realize the full benefit that peat and bark based mixes offer, these water repellency issues must be addressed. An easy application of AquaGro 2000G to your mix can overcome its water repellent properties, saving money on water, fertilizers, other soil amendments, and labor. AquaGro 2000G ensures the continued wettability of your bark or peat based mix. It not only allows for fast initial wetting, but also helps plants to get established quickly. Research has shown that air to water ratios are optimal in mixes blended with AquaGro 2000G. This more consistent growing environment means healthier, more robust plants. AquaGro 2000G provides faster, more uniform water distribution and better moisture retention so that less applied water and fertilizer is wasted through runoff. It ensures sufficient moisture levels at initial wetting and reduces the need for multiple waterings. With a more balanced growing media, plants quickly settle in and can get off to a fast, healthy start. Try AquGro 2000 G Today! For more information about AquGro 2000G, including pricing and availability, contact your local Aquatrols distributor today!